Two interesting studies of Pauline Starke, Metro-Goldwyn-Mayer featured player appeaering in “Love’s Blindness” by Elinor Glyn, in which she wears Hepner’s wigs exclusively. The top photograph is of Miss Starke in a long, black wig, dressed in a girlish fashion designed especially for her by Hepner. 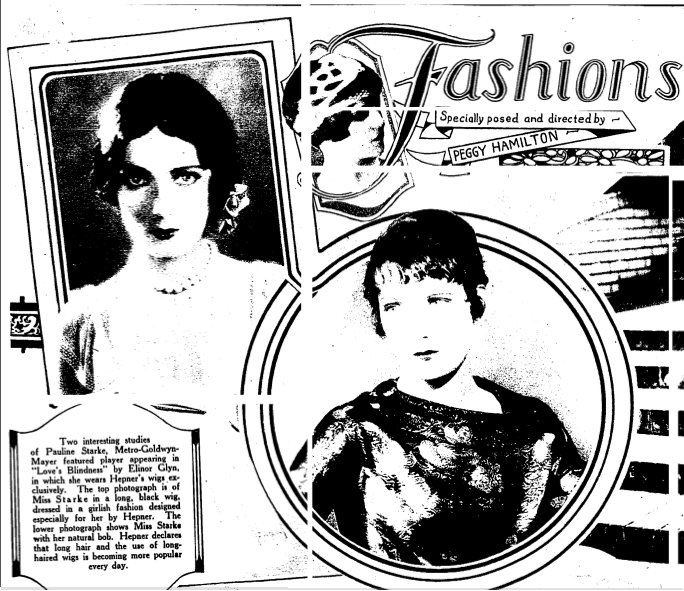 The lower photograph shows Miss Starke with her natural bob. Hepner declares that long hair and the use of long-haired wigs is becoming more popular every day. You are currently browsing entries tagged with Love’s Blindness (1926) at flycz.